"... This is my version of the tramway and metro network of Marseille, France. It is one of my recent maps and I have tried to give it a 80s look but I am not sure I got it right. Overall, it’s not necessarily a map for daily use but more an interpretation of the system. 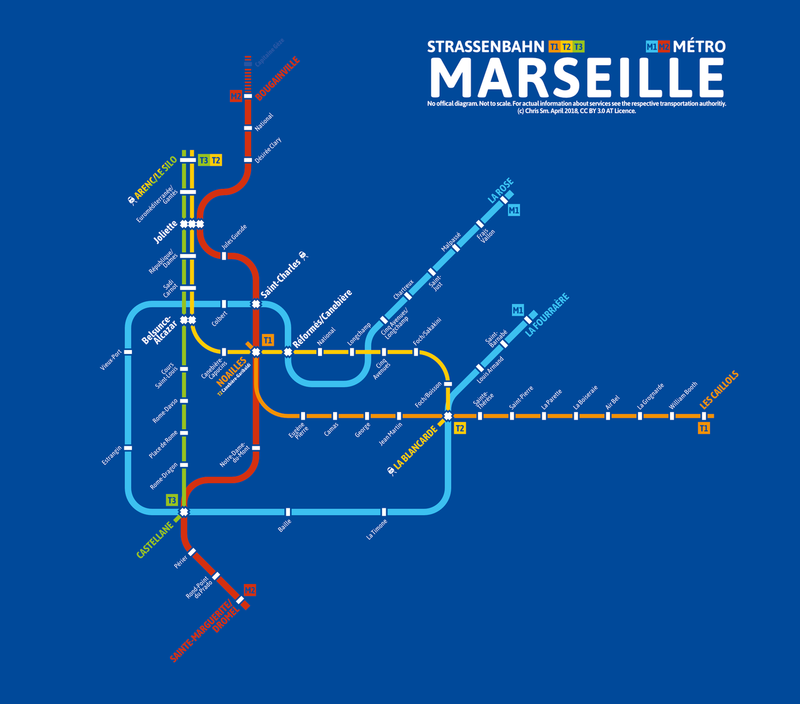 Transit Maps says: For a relatively simple network like Marseille’s (with just two Metro lines and three tram lines), a diagram like this is perfectly workable for daily use, Chris. It’s simple, clear and still retains a good sense of how the lines fit together spatially… perhaps with the exception of the way that the M1 Metro dips inside the T2 tram line between Réformés/Canebière and Cinq Avenues. In the end, the way you’ve shown it allows your labelling to remain consistent and all the stations are still in the right place, so it’s really not that big an issue. ..."